I think that my husband would agree with the notion that of the two of us, I’m the one who is more of the foodie. I have food on my mind all the time, always thinking about the next meal, the next dish, the next dessert. And yet, it seems that it’s always my husband whose the one coming up with suggestions for new restaurants or eateries for us to try. My husband claims that he doesn’t ever really care where we eat or what we eat, but secretly, I think he enjoys the excitement of trying new places as much as I do, or else why would he bother seeking out new restaurants for us to try out all the time? One such occasion came about when my husband was trying to find a new restaurant to take me for a birthday celebration. Mind you, I don’t just celebrate my birthday, I celebrate my birth month! So my husband has to come up with all sorts of ideas to keep me entertained and well-fed for my birth month. One Friday afternoon during my birth month, my husband sent me a text message to let me know that he had made reservations for Sunday dinner at a restaurant rated as the #1 restaurant in Santa Monica on TripAdvisor. Tar & Roses is the first foray into being a chef and owner of his own restaurant for Andrew Kirschner. Krischner, a Santa Monica residence returns home to open a restaurant that brings together his highly refined skills with using exotic game meat, sustainable food, bold flavors and merging “classical cuisine with modern sensibilities.” Only open for dinner service 7 days a week, this small, but very quaint restaurant with an open kitchen creates for an inviting and intimate dining experience. With a bit of an Italian-inpsired menu and a wood-burning oven which uses a rotating selection of aromatic wood, the restaurant also specializes in craft beer and speciality wines, all of which reflect the well traveled experiences of Kirschner himself. Tar & Roses had a fully-stocked bar, but also offered a great selection of beer and wine. After looking through the options, there was a beer that my husband saw that caught his eye. It’s a beer that he tried for the first time month’s earlier at a different restaurant we dined at, and he really enjoyed. 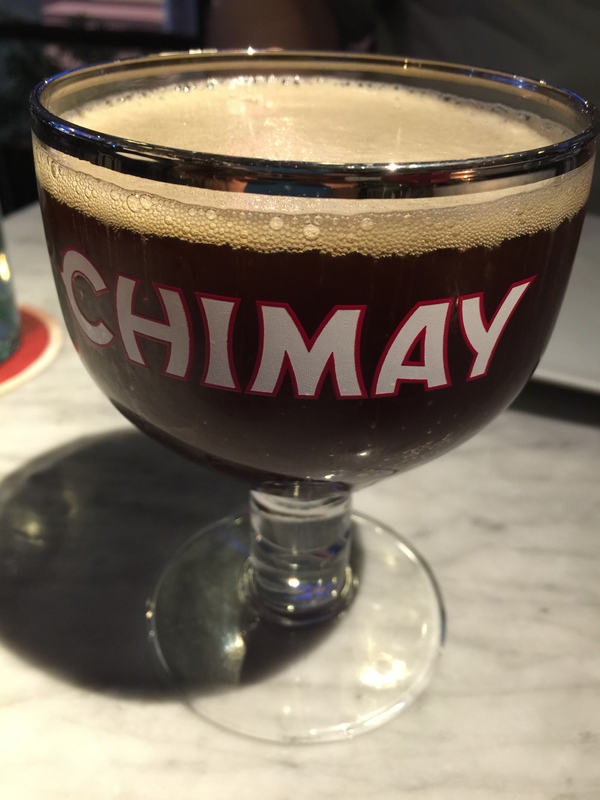 Made by Belgian monks at a monastery in Belgium, Chimay is one of the most popular Belgian beers. My husband couldn’t help ordering a bottle of Chimay for dinner. Served in the bottle at the table, the beer is then poured into a special Chimay beer glass. The beer was just as tasty as my husband remembered for his first experience with Chimay. 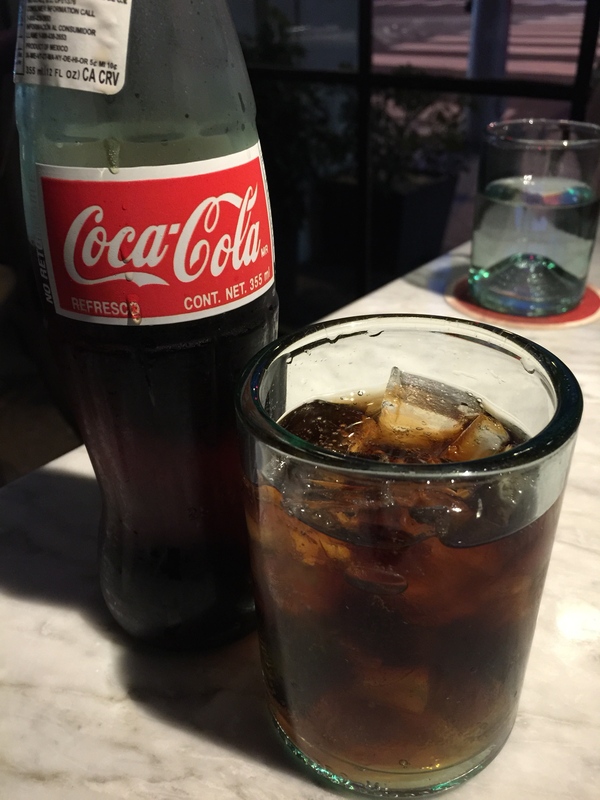 With a more limited non-alcoholic drink menu, I opted for a bottle of Mexican coke with real cane sugar. Can’t ever go wrong with this option. As a tapas-style restaurant, we knew going in that we’d be ordering a lot of different dishes since we wanted to try out a lot of different items. How else do you get a feel for the restaurant without trying a bunch of their dishes. We warned our waiter that we’d be ordering a lot of food, and he reminded us that we had definitely ordered a lot of food. Good thing we were hungry! My husband was particularly excited about his choice of ordering the popped corn off of Tar & Roses “snacks” menu. Essentially this is regular popcorn, but flavored with crisp bacon, brown sugar and chili. The brown sugar is heated and melted with the chili to create a sort of syrup or glaze. 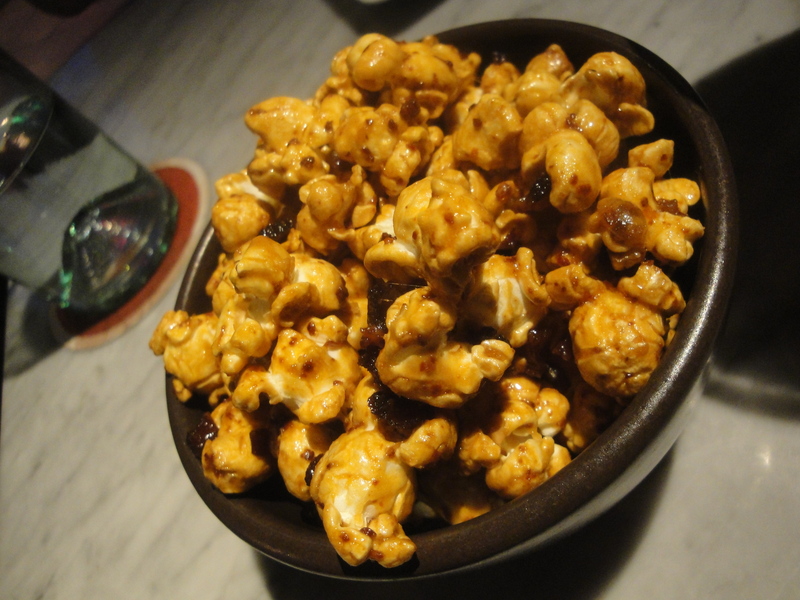 The popcorn and bacon are then coated in this brown sugar and chili glaze that is allowed to cool thereby creating a sticky and flavorful popcorn treat. I was interested as to how this would taste as the combination of brown sugar and chili was a bit different, plus there was popcorn and bacon. The texture of the popped corn was almost like caramel corn in feel, but with a distinctly different flavor. The brown sugar and chili actually worked as the brown sugar helped to add sweetness and cut into the heat from the chili. However, with my very sensitive-to-spicy-things tongue, the chili still got to me. But the popped corn was sweet enough that I could still enjoy the popped corn, even with the spice. The bacon flavor was also quite prevalent in the popped corn, and with every few kernels of pop corn, you got little bits of bacon stuck to the popcorn, which also added the saltiness to the dish to balance out the heat and the sugar. The next dish to come to the table was another selection of my husband’s from the “snacks” menu, the oxtail dumplings. I will admit that this wasn’t really my first choice in food option, but I figured I could at least give it a try to leave the rest to my husband to eat. Stewed oxtail meat was wrapped inside a ravioli and boiled and finished in some sort of a rich sauce. 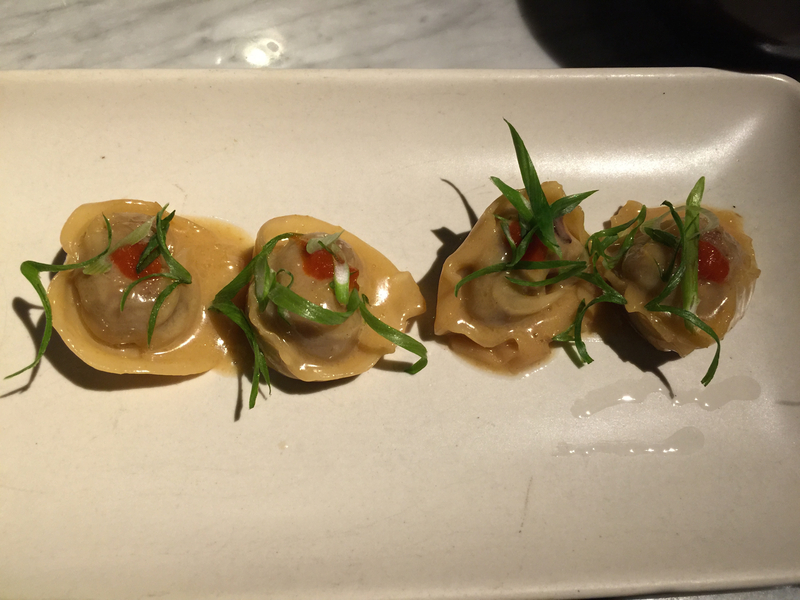 4 raviolis per order, each oxtail dumpling was served with scallions and chili. For me, I think the chili suspiciously looked and tasted like sriracha, which I am not a fan of at all. After carefully scraping the chili off of my dumpling, I was finally able to sample my oxtail dumpling. The flavor of the oxtail meat was rich and full. The meat itself was tender and the ravioli was a great way to present the dumpling. While the dish was better than I expected it to be, I wasn’t instantly in love with it either. My husband definitely enjoyed the oxtail dumplings more than I did, but we both figured that would be the case. 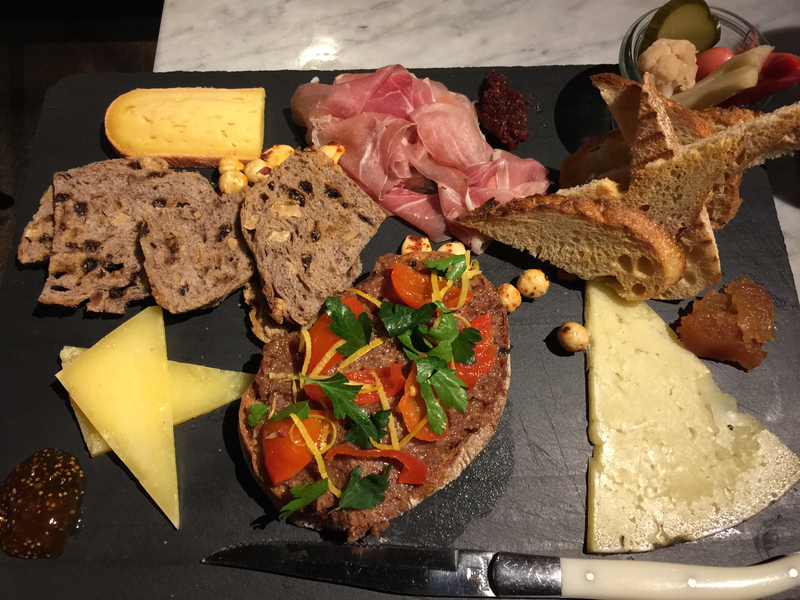 One item I really wanted to order was the bruschetta, charcuterie and cheese plate. With a selection of cured meats and cheeses to choose from in varying combinations, you could choose any combination of 3, 5 or 7 selections. We opted for a selection of 5 different items. First, from the bruschetta menu, I chose the bacon jam with peppadew peppers and lemon. My husband chose from the cheese menu the grayson fro Virginia which is semi-soft, raw cow cheese; the alpha tolman, which is a firm cheese from Vermont also made of raw cow’s milk; and the dry jack special reserve from California which is a hard cow’s milk cheese. Finally from the charcuterie menu I selected prosciutto americano from Iowa. After all, how can you go wrong with prosciutto? The bruschetta, charcuterie and cheese plate comes with some grilled crostini, pickled vegetables, roasted macrona almonds, dried cherry mostarda and membrillo. My husband and I started off splitting the bacon jam bruschetta. Again, as I don’t like peppers, I took the peppadew peppers off of my half of the bruschetta, but I thought that the bacon jam bruschetta was amazing. The bacon flavor you could definitely taste, but in a jam, the overly salty flavor of bacon wasn’t so strong, which was perfect. The lemon gave a little bit of an acidic taste that cut through the richness of the bacon jam. Sometimes, bacon is overused in various food items just because everyone thinks bacon makes everything better, but in this case the bacon jam wasn’t a novelty, it was actually a great accompaniment to the grilled crostini bread. Of the three different cheeses we ordered, my favorite was the hard dry jack special reserve cheese. It had a strong aged flavor to it, but with the subtle hints of jack cheese that were perfect. Using the grilled crostini, topping it off with some of the membrillo, the dry jack special reserve and a little of the prosciutto americano made for the perfect bite, at least for me. My husband enjoyed the other two cheeses more than I did. He liked the semi-soft grayson, whereas I didn’t really enjoy the grayson at all, but I’m also not a big of an of semi-soft and soft cheeses. The alpha tolman, for me, was ok and something I could eat, but not something I would necessarily order. My husband definitely enjoyed the alpha tolman more than I did. But that’s the beauty of being able to order a number of different items on a plate such as this, you get to try a bunch of different flavors and find out what you like and don’t like. Our next set of dishes came out as a trio of seafood dishes, but all very different, and all with very distinct flavor profiles. 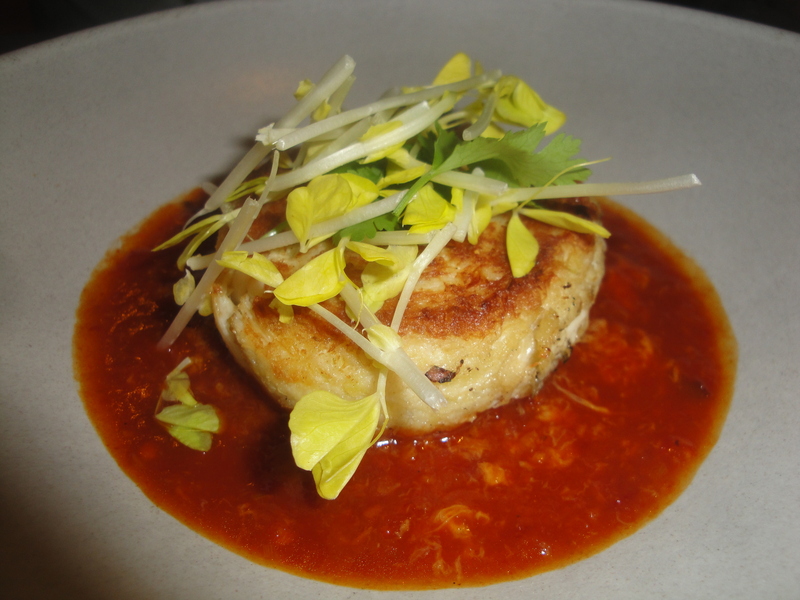 The first dish was the Singaporean chili crab cake. As soon as my husband saw this on the menu, he knew he’d be ordering it because it was a reminder of our time in Singapore a few years ago when my husband ordered chili crab spaghettini at Halia at the Singapore Botanical Garden. Chili crab is the one of the most popular and most well-known dishes to come out of Singapore, and my husband wanted to relive all of those flavors all over again. At Tar & Roses, their take on the traditional Singapore chili crab was to take a pan-fried crab cake and set it atop a bowl of the chili sauce. My husband assured me that the chili sauce wasn’t that spicy and I should give the crab cake a try. I’ll admit, the sauce wasn’t actually too bad – again, not something I would order or want to eat, but to take a forkful or two, it wasn’t too bad. The crab cake was of a good size and incredibly meaty with wonderful, sweet crab meat. My husband enjoyed the chili sauce as it added just the right touch of spice and heat to the sweet crab meat of the crab cake. It was a great representation of what chili crab tasted like when we were in Singapore. In keeping with dishes that reminded us of other dishes we’ve had in the past, Tar & Roses was serving a special dish of the day that the chef called North Shore shrimp truck shrimp. As soon as we heard the waiter describe the dish, my husband and I looked at each other and smiled knowing we’d be ordering this dish. If it tasted half as good as the shrimp scampi that we ordered from Giovanni’s Shrimp Truck on the North Shore of Oahu last year, then this dish was going to be amazing. The waiter said that chef’s special was inspired by the shrimp trucks of the North Shore of Oahu, made with 6 shell-on shrimp tossed in lemon, oil and lots of garlic along with chili, honey and butter all served over grilled bread. First off, the shrimp were of an enormous size, these were like giant prawns rather than just shrimp. 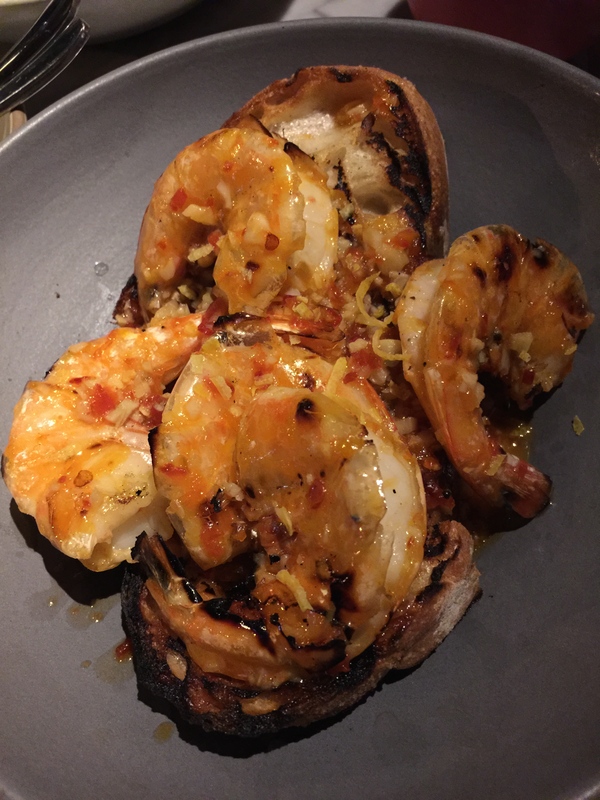 Perfectly grilled with a bit of char, the shrimp are set atop perfectly crusty grilled bread and then the garlic, butter, chili and honey sauce is poured over the entire dish. The shrimp absorb the flavors of the sauce as does the bread which just soaks it all up. The taste of the dish was outstanding. I admit that it was a bit spicy with all of the chili as it was just a bit too much for me, but I was still able to enjoy the dish. The shrimp were tender and succulent and well cooked. The grilled bread underneath it all was a perfect way to sop up all of the delicious flavors of the dish and were a great accompaniment for the dish. This was definitely a North Shore shrimp truck-inspired dish and my husband and I were glad that we ordered it. The final seafood dish was the smoked trout crostini. I’ve never been a big fan of smoked fish until the past few months when I’ve had it at a couple of restaurants and really enjoyed, so I thought I’d give it a try at Tar & Roses. 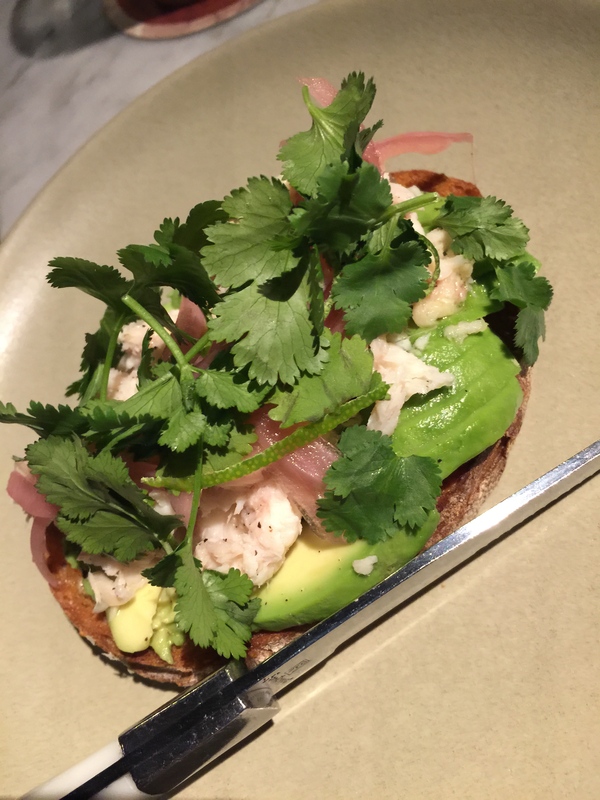 The smoked trout crostini was served with avocado, pickled onion and cilantro all atop a crusty grilled bread. The crostini was quite large, and even cutting it in half to split with my husband, my half of it was more than plenty. One bite into the crostini and I knew I made the right decision in ordering it. The grilled bread was crusty and crunchy and perfect. The next lawyer was thin-sliced, perfectly ripe and delicious avocado. It’s creamy goodness blended perfectly with the smoky flavor of the trout that topped the avocado. I’m not sure I’ve ever had smoked trout before, but if this is any indication of what smoked trout tastes like, you could serve me a ton of it. It was smoky, and slightly sweet and tender and delicious. The smoked trough was truly a star of the dish, and everything else on the plate just helped to enhance the flavor of the trout. The trout was topped with a bit of picked onions, which provided a bit of acidity and tang to the crostini to cut through the sweet trout and the creamy avocado. Finally a bit of cilantro atop the whole thing for a bit of nutty flavor that just tied the whole dish together. Personally, the smoked trout crostini might have been my favorite dish of the night. 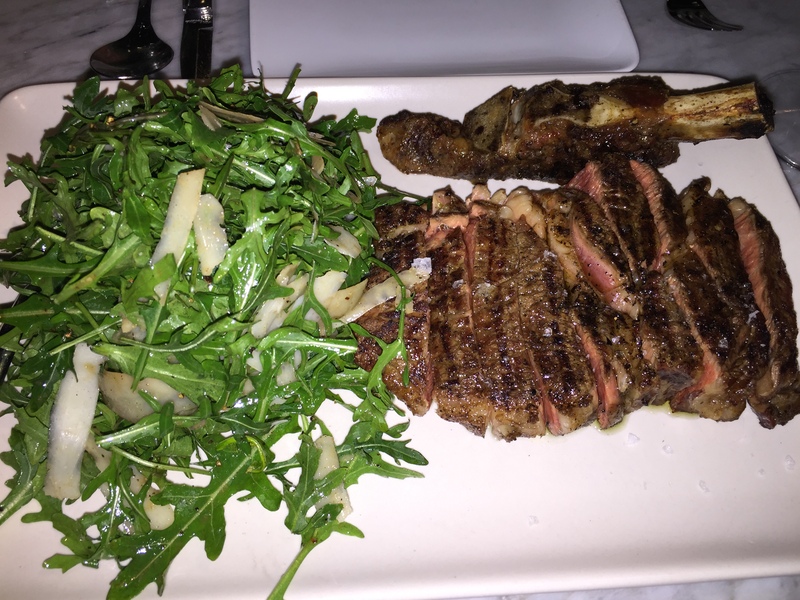 We finally got to the main course for the night, the dry aged ribeye for two. We knew having ordered so much food that we would probably have trouble finishing all of it. But we also know that with our main course being steak, we could always take it to go if we couldn’t finish it. Served along size an arugula and parmesan salad lightly dressed with a vinaigrette, the 24 oz ribeye was served medium rare and was already pre-sliced. Even knowing that this was ribeye for 2, it was still enormous and my husband and I couldn’t finish more than a couple of slices each. No worries though, I did end up packing up the ribeye and salad to go and had it for lunch the next day and it was still terrific. The ribeye was incredibly tender, and very flavorful. This may have been one best steaks I’ve ever ordered. And the arugula and parmesan salad was just as fantastic with the nice peppery bite from the arugula the saltiness from the parmesan and then the acidic tang from the dressing. A great, filling dish that my husband and I would have inhaled if we hadn’t already stuffed ourselves previously. As a side to this steak, I also ordered a small dish of brussel sprouts with pancetta, chestnuts and mustard. I’ve grown to love brussel sprouts recently and I couldn’t resist giving them a try at Tar & Roses. The brussel sprouts were perfectly roasted with a bit of char and browning on the edges which gave it a bit of a crispy exterior which was hiding a sweet, and succulent interior. 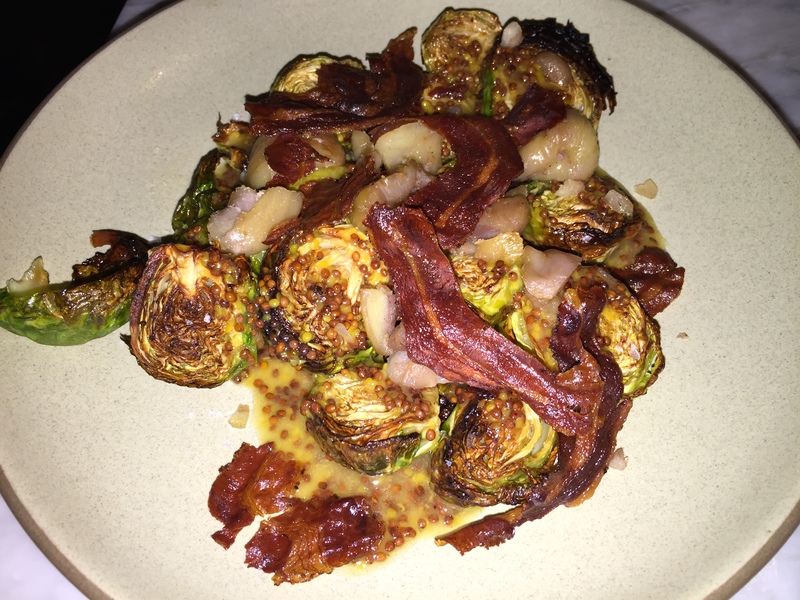 Crispy pancetta was sprinkled throughout the dish, and the brussel sprouts were mixed with some nutty chestnuts to help enhance the nutty flavor of the brussel sprouts. Everything was then tossed with a whole grain mustard dressing. The mustard was a bit strong and I would have preferred a little more subtle mustard flavor, but I did like the use of whole grain mustard as the whole grains gave the dish some added texture and flavor. The salty, the sweet, the crispy and crunchy all come together in this beautiful vegetable dish. It’s no secret that I, especially, am a glutton for punishment and have no shame when it comes to dessert. I could be stuffed to the gills, but if the dessert menu is promising, I will somehow, someway, find room. My husband is generally game too when it comes to desserts. After looking over the dessert menu at Tar & Roses, neither my husband nor I could resist. So even though we had to go boxes of food, we still felt the urge to order desserts. 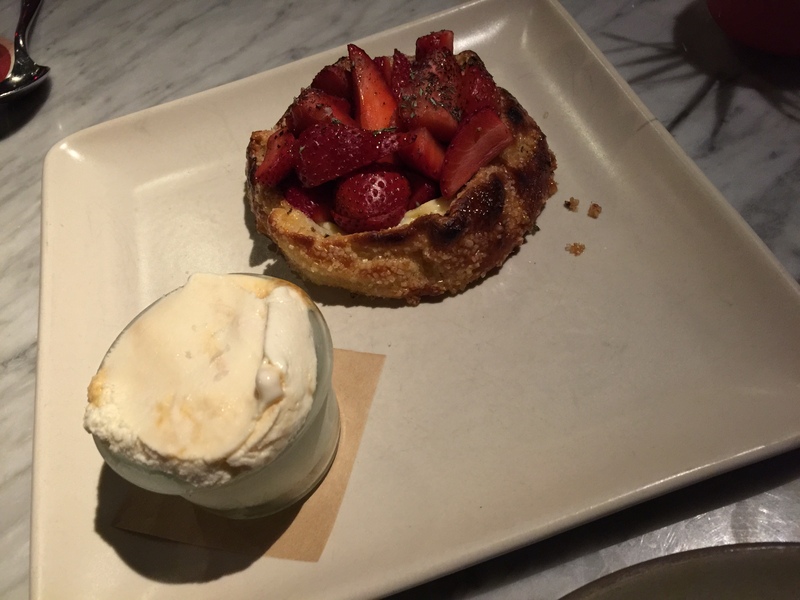 My husband chose the strawberry ricotta crostata with honeycomb ice cream. First off, I’m sure my husband saw ricotta and thought “cheese!” Of which he claims that there’s no such thing as bad cheese, and when it’s in a dessert, it must be that much better. A crostata is kind of like a pie with dough that is baked and some sort of filling inside. 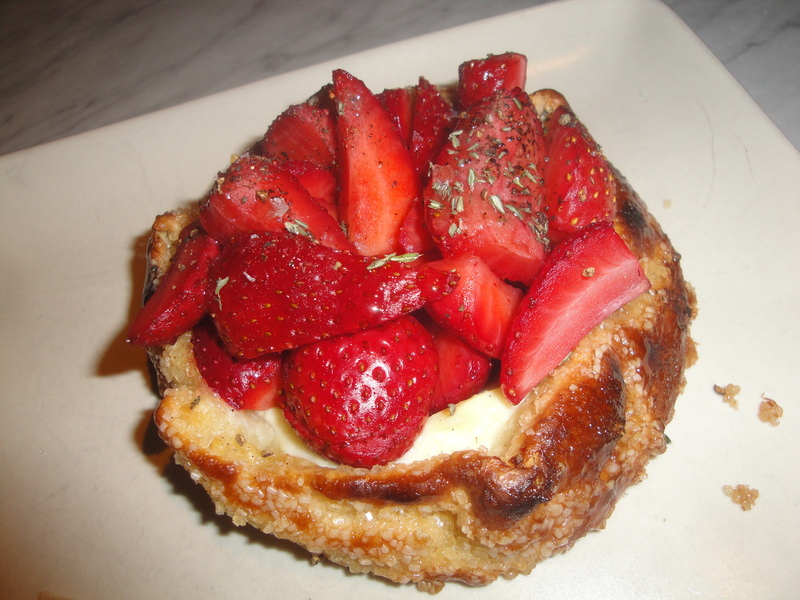 In this case, the semi-sweet sugar coated dough is baked around a filling of sweet, creamy ricotta cheese and topped with fresh sliced strawberries sprinkled with some basil. On the side is a small mason jar of honeycomb ice cream. Normally, this wouldn’t be the type of dessert I would order or enjoy, but after my husband encouraged me to try a bit, I was blown away by how yummy it was. The dough was perfectly golden brown and crispy on the outside and flaky, and warm inside with a nice buttery flavor. The combination of the ricotta cheese and the fresh sliced strawberries was like heaven, almost like strawberries and cream in texture and consistency. Combine that with the honeycomb ice cream which tasted like fresh honey, but wasn’t overly sweet, and the dessert was a homerun. Using fresh sliced strawberries instead of macerated strawberries, I think was the key to keeping the dessert fresh and light and not overly sweet. Taking everything together, the crostata with the very unique, honeycomb ice cream was fantastic. It was a light, fresh, delicious and incredibly refreshing dessert. My husband agreed and couldn’t have been more delighted over his dessert selection. For my dessert, I went the chocolate route ordering the chocolate “tar” bar with hazelnut and salted caramel ice cream. First off, the “tar” bar was some sort of silky smooth chocolate mousse which seemed like it was rolled in cocoa powder all set atop some sort of airy, wafer crust. The “tar” bar was fantastic, lightly sweetened, and with incredible texture. I really liked the way that the dessert used cocoa powder to add texture, but also mute some of the sweet flavors of the chocolate. 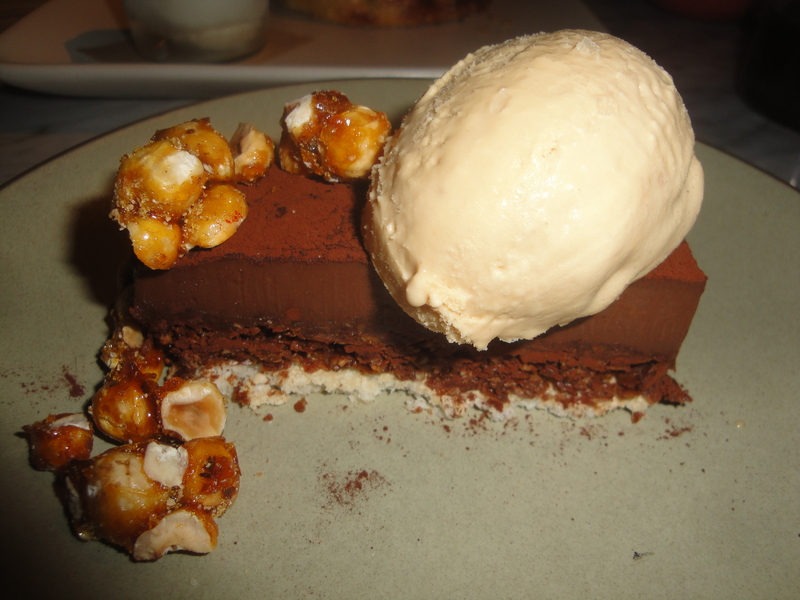 The addition of pieces of caramel corn on the plate added a nice amount of texture to the dessert that was a contrast to the smooth “tar” bar as well as the creamy salted caramel ice cream. With the slightly sweetened chocolate-flavored bar, the salted caramel ice cream paired nicely adding just a hint of salt, which actually helped to draw out the sweetness in the chocolate. It was a good flavor combination. The sweetness in the chocolate muted the saltiness of the ice cream, so they worked in perfect harmony with each other. The dessert looked heavy, but actually tasted light and airy and was the perfect ending to my meal at Tar & Roses. I must admit that my husband made and excellent choice when he suggested that we dine at Tar & Roses for the last of my birth-month meals. I can easily see why this restaurant has been rated as the #1 restaurant in Santa Monica on TripAdvisor. The restaurant’s setting and atmosphere is a perfect place to go for a family meal or a date night. 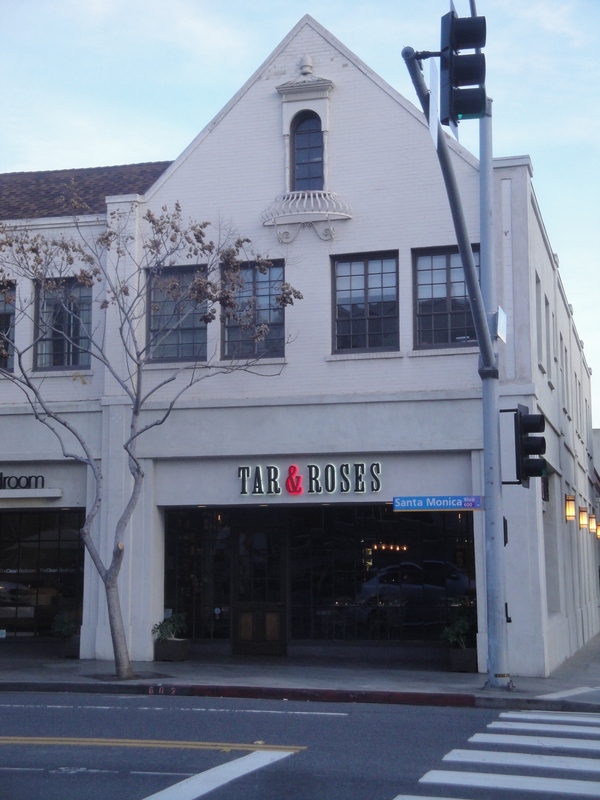 Dining at Tar & Roses felt like discovering a secret hidden gem that most people don’t know about, but should. 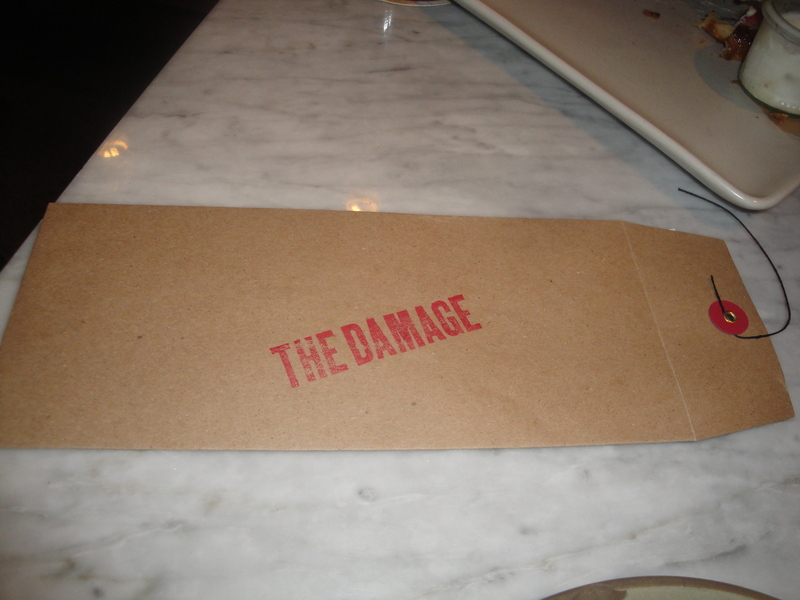 The menu was wide and varied, the food was incredibly tasty and well prepared and the service was spectacular. The next day, I raved about the restaurant to everyone at work, I’d say that’s a pretty ringing endorsement of how terrific the restaurant was. My husband and I still talk about Tar & Roses to this day and are already looking forward to our next trip to this terrific restaurant.